Hello again, Don Milne here, your ROADTRIP-'62 ™ traveler. On this, the first of our journeys, we are traveling US-23. We're at Oscoda, Michigan, two days out from the northern beginning point at Mackinaw City. We'll be heading south, using the roads of 1962 on our third day along Lake Huron, part of the great inland sea that is the Great Lakes. Today we finally reach a freeway, and will leave the northwoods and enter farm country. As we drive this virtual roadtrip, if you see anything you like I encourage you to get out on the road and enjoy it in person. A virtual roadtrip may be fun, but there's nothing like the real thing! And, at any time, click on a link below to learn more about the places along the way. Now, let's buckle up again and go! Hope you enjoyed the sunrise! I've been up early and now I'm ready to go trout fishing on the Au Sable River. Seasons run from January through September. Careful wading is a must as the river is noted as dangerous by some standards, and some anglers recommend a boat. Trout varieties caught in good numbers every year include brown trout, rainbow trout, and brook trout. Or, if you'd rather try some other fish, the walleye fishing is good in May and salmon fishing is also possible both on the river and out in Lake Huron. Below the Foote Dam right into Lake Huron is also a quality steelhead fishery. Charters are available in Oscoda, and I'm sure you could have hired a guide back in 1962 also. Continuing down the Lake Huron coast brings us to the twin Tawases: East Tawas and Tawas City, Michigan. North of town lies Tawas Point State Park. The park contains 183 acres on the end of a sand spit that forms Tawas Bay. This is a highly unusual place to take a walk because you can walk for over a mile in shallow water, walking out into the bay almost a city block. The water is shallow and warm for swimming or wading, so I'm going to get wet! Tawas Point is also a stopover for hundreds of species of migratory birds, which makes it a favorite bird watching location. Michigan Audubon will hold its Tawas Point Birding Festival here on May 13-15, 2011. And the bay has long been considered one of the finest sailing areas in the country, which can be seen by the many sailboats out in the bay. Also located within the park is the Tawas Point Lighthouse, just in case you needed one last lighthouse viewing. This lighthouse is the last representative of a Victorian-era style light station remaining on the Great Lakes. Traveling through East Tawas along US-23, we stop at the East Tawas State Dock. This is a great place to walk out into the water but stay dry! Usually has lots of interesting boats docked also. I believe the current structure was built over an older pier, so we could have walked at least part way out in 1962. Adjacent is the campground of the East Tawas City Park and the Iosco County Historical Museum. While the house the museum occupies has been here since 1903, the museum was only established in 1977, so it's too new for us to visit. If instead you're looking for some unusual shopping today, I suggest Norman's. It's a bright green building that always has merchandise outdoors like a perpetual sidewalk sale. Many of the Norman's stores in this part of Michigan date back to the 1950's, so I believe we could have shopped here in 1962. It's mostly clothing, including leather, beachwear, shoes and speciality clothing. We need to stop for lunch before we leave town, so I suggest Marion's Dairy Bar, right on US-23 just north of Norman's. You can't miss it with the giant boy holding an ice cream cone, up on the roof! While the ice cream boy was only installed in 1969, Marion's has been here for over 60 years, so it fits our timeframe just perfectly. Just in case they don't serve lunch with the ice cream, we might have to walk a block to the Dairy Queen. It may have been here in 1962, but I'm not sure. Anyway, a couple of old-fashioned coney dogs and fries with my ice cream would make a simple but delicious lunch. Seven miles south along the coast is another mine pit, but not for limestone. At Alabaster, Michigan is the pit and lake freighter loading dock of a gypsum mine. This quarry was opened in 1862 and helped supply gypsum for buildings at the Chicago Columbian Exposition of 1893. The mine closed just a few years back, but in 1962 it was working overtime, sending gypsum out to make drywall board for the suburban housing boom. Millions of little ranch houses were built with gypsum from right here. The US Gypsum Company also had additional mines west of here, and it all came by railroad to be loaded onto freighters here. Michigan was a leading producer of gypsum for over a century. You can still find a working gypsum mine in Gypsum, Colorado, on our US-6 roadtrip. We could also have mailed a postcard from here in 1962, until August 17, when the Post Office closed. Between Alabaster and Au Gres a number of streams and drainage ditches cross US-23, and they are famous for the smelt spawning runs in the spring. Smelt are a small fish, introduced to Michigan's lakes as food for stocked salmon in 1912. It is naturally an ocean fish and by 1930 they had colonized all the Great Lakes. They were first regarded as a nuisance, but systematic harvesting began in 1952. I remember driving up here about 1962, late at night, for dip-netting with my dad. My brothers and I would sleep on the way home down US-23 in the wee hours of the morning, with steel tubs full of smelt in the trunk. The only nuisance I found regarding smelt was in cleaning thousands of small fish over the next couple of days so we could freeze them! Since the early 1980s the smelt population has fallen off, and rather than scooping up a dip net full, current averages are only a few smelt at a time. I would guess only the most avid smelt fishermen are still enjoying the sport. There's a roadside park at the site of the former "Singing Bridge", which was the most famous smelting spot. As we follow US-23 south, it eventually turns west and we end up in Au Gres, Michigan. About three miles west of Au Gres, near Lentner Road, you can see a small limestone outcropping along the south side of the road. This is the last rock you'll see until we get near Toledo, Ohio! Near Toledo we will be back in the same rock formations we saw in the Calcite mine back at Rogers City. Between here and there all the land was covered with glaciers in the last ice age, and is now either flat plains of sand and clay deposited by water, or hills of sand and gravel left behind by the retreating ice. Glaciers covered much of mid-Michigan and northern Ohio up to a mile thick in places. As a consequence of their passing, we won't find any real hills along US-23 until we get nearly to Kentucky. As we start heading west, away from Lake Huron, we come to Omer, Michigan. This town has the distinction of being the smallest incorporated city in Michigan. As this is our last outpost of the northwoods, I've decided to take that canoe trip. The Rifle River passes through town and it's shallow with a sandy bottom making it an excellent canoeing or even tubing stream. Russell Canoes has been here since 1960, which makes it perfect for us. I'm taking the shortest trip, about 2 hours of leisurely floating and paddling downstream. See you when I return! The old Michigan Central Railroad depot is right in downtown Standish, Michigan and worth a stop. It's an unusual stone building, constructed in 1889, that now houses the local historical society. The stone for the structure was brought in by wagon load by local farmers. There is a twin of this depot in Lawton, Michigan. Up until 1965 you could have still taken a train ride from it, but not today. Almost across the street is Wheeler's Restaurant. If you hit town at lunch time, stop in and have a really overstuffed Philly steak sandwich! Big enough to feed two, in my opinion. Wheeler's has been here since 1934 and the building still has some evidence of that time inside, including a real wooden phone booth, though the phone is disconnected. Leaving town, we pass Jay's Fruit Market, one of the last of the fruit stands along US-23. Did I mention we were entering farm country? Where we started three days ago the landscape was 70-80% forests but has been steadily dropping. From here south through Michigan, it will be only 10-20% forested, with only a slight bump up in Livingston County. The glacial plains we're entering are generally very rich soils, so they have been intensively farmed since they were settled. Anyway, back in 1962 there were dozens of these farm stands, all the way from Standish to Kawkawlin, Michigan. I remember especially the hand painted signs for melons, potatoes, cucumbers and apples. Nowadays most of the fruits and vegetables are sold to wholesalers or packers, and the fruit stands are mostly gone. The few that do remain are often supplied by wholesalers, with fruits and vegetables that are not even grown in the area. Doesn't matter to me: I'm stopping to get a few items for picnics and snacks here, same as I would have in 1962. Pinconning, Michigan is a spot for a treat at Purtell's Restaurant & Ice Cream. This place has been dishing out great ice cream since probably before I was born and the ice cream is worth a stop no matter what time of day you come through town. Pinconning also hosts Deer Acres Storybook Amusement Park, which is just what the name says: it is an amusement park decorated with storybook characters. Yes, more concrete sculptures! Mostly Mother Goose style characters, and the rides are mostly for the under 12 set. But the kids have been having fun at this family-owned attraction since 1958, and they still do today. It was closed for the 2010 season and acquired by new owners who expect it to open again this summer. It has an older style gift shop which is perfect for us. And, if you like animals this is also the place for you, because it has a nice petting zoo. Deer Acres is also connected to a spot we'll see a few miles down the road. The antique carousel was relocated here from Tony's Amusement Park in Bay City, Michigan when that site closed. Besides the fruit stands, this part of Michigan also had several cheese shops. The difference is that there are still several remaining: Williams Cheese Company, Pinconning Cheese, and Wilson's Cheese Shoppe, all in Pinconning. I recommend stopping here for some more picnic supplies. Wilson's moved into their building in 1942, having outgrown a place across the street at the original cheese factory. I'm stopping instead at Williams today for one of their cheese spreads and some good bread to spread it on. The original attraction at all three stores is Pinconning Cheese, though they are all fully stocked stores today. This cheese is a style of colby, but can be aged for varying sharpness, which some colbys cannot. It originated in Pinconning, but is now produced elsewhere in Michigan. Williams also sells Pinconning and a full range of other cheeses through supermarkets. As for the name, Pinconning comes from the Native American word (Ojibwa, I believe) "O-pin-nic-con-ing". It referred to the place of the potatoes, for the wild potatoes that grew in this area. More unusual shopping is found at Linwood, Michigan. What began in 1945 as a small bait shop has grown into a big box full of outdoor equipment. Frank's Bait and Tackle was here in 1962, for supplies for fishing on Saginaw Bay. In 1973 they expanded and are now Frank's Great Outdoors with departments such as fishing, hunting, marine electronics, clothing, cooking, and gifts. Not a big as the Cabellas farther south on US-23, but this store is more authentic to our period. At Kawkawlin, Michigan, you may notice there are farm fields with pumping oil wells. These have been active since well before 1962 and ever since I was a kid I remember the distinctive smell of crude oil as we drove through this area on US-23. Right at Kawkawlin, we're making a slight detour off US-23 on Beaver Road, to visit Bay City State Recreation Area. It used to be known as Bay City State Park, but the state added some acres of wildlife area and changed the name. The park is right on Saginaw Bay and in the 1960s had a good swimming beach, but as the shallow bay has filled in and vegetation has taken over more area, the beach is not as pleasant. If you want to go swimming or wading today, the best bet is around the west side of the bay, along some low sand dunes. Here the beach is cleaner and shallow enough to walk out quite a ways. Many people park their boats offshore and use the water instead of coming at it from within the park. The park is a good spot for our final view of Lake Huron: tomorrow we head inland for good. There are hiking trails around the Tobico Marsh, one of the largest remaining freshwater, coastal wetlands on the Great Lakes. The trails run through 2,000 acres of wetland woods, wet meadows, cattail marshlands and oak savannah prairies. Theres even a beaver dam! To complete a 1962 day at the beach and woods, there used to be a mini-golf and roller skating rink next door, and even small amusement park. Today the Rollaire Rink skating rink and Tonys Amusement Park are gone, but someone has built a new mini-golf course across the street so lets play in memory of the old course. Believe it or not, singing star Madonna frequented Bay City, Michigan because family lived here! An interview with her brother Martin Ciccone says, ''We would go to State Park Drive, go up to the park, go fishing and swimming. We would go to Tony's Park and ride the carnival rides and play golf and all that.'' And the Rollaire Rink also had a rock and roll connection, though it was after 1962. Big names such as MC-5 and Bob Seger used to play concerts there on Tuesday nights in late 1960s. About the only thing left from 1962 is the state park itself and Mussell Beach Drive-In, a great soft-serve ice cream place. So we don't miss any of US-23, let's go back out the way we came in from Kawkawlin. There we find the start of the freeway, which was actually here in 1962. Michigan got an early jump on freeway construction and by 1963 you could drive all the way across the state from Toledo, Ohio to Sault Ste. Marie, Michigan. But because it is within 5 miles of the old road, we'll still take the old road into Bay City, Michigan. There are no services along the freeway yet in 1962, and we will need dinner and a motel soon. On our way into Bay City, we pass an old Putt-Putt brand mini-golf course. It's authentic to the 1962 period but we've waited too long and you can't play here. Putt-Putt Golf & Games is closed and currently for sale. It appears that miniature golf in Bay City just isn't making money anymore. I wonder if we'll find any open older miniature golf courses on the rest of the trip? Turning east at Midland St., I'm heading into downtown Bay City for one last shopping stop today: St. Laurent Brothers. This is a peanut and candy store that has been here since 1904, roasting their own peanuts. They also roast other nuts daily at the store; everything from almonds to cashews to macadamias. St. Laurent's also makes their own hand-dipped chocolates. And, it's a great spot to buy some vintage candy, many of the same things you could buy in 1962, only they cost more today! 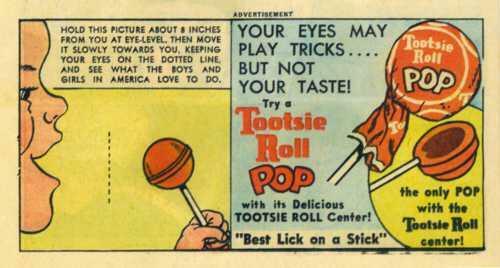 I'm going to stock up for the rest of this trip on some Milk Duds, Wax Lips, some M&Ms Candies, Pixie Sticks and my favorite: Tootsie Pops! I also recommend seeing the Historical Museum of Bay County. It was not open at its present location of 321 Washington Avenue in 1962, as the building was then an armory. However, the parent organization, the Bay County Historical Society, has been preserving local history since 1919, and was located in the Bay County Building. Back then, they displayed as much of their collection as would fit in their space, with rather minimal notes. Today, they have professionally-designed exhibits. I was particularly intrigued by their exhibit on kit-built homes. The Aladdin Company of Bay City was the first company to offer "kit" houses by mail-order. That's right, you could buy your whole house by mail and have it delivered! All the lumber was pre-cut and numbered, plans were included, and even nails, hardware and miscellanoeous items. By 1940, their catalogue offered over 450 different models. The company was begun in 1906 and continued to manufacture houses until 1981. They had delivered mostly to local train stations, but freeways changed that and by the 1960s the Aladdin Company was delivering houses with trucks right to your foundation. There were also two other kit home manufacturers in Bay City: Lewis Homes/Liberty Homes and Sterling Homes/International Mill and Timber. Let's go back out to old US-23 and get a motel for the night. Strangely, many of the old motels are not only in business along Euclid Av., but several have been remodeled and are quite comfortable. My mother stayed in Paul's Motel a couple of years ago and says it's quite comfortable. I'm trying the Delta Motel, which has been updated so well it even has high-speed internet access! Maybe I can watch another old TV show or listen to some old music on my computer tonight? After we get our stuff settled, it's time to eat. We'll make a fast food stop tonight at Mr. Hot Dog, a hometown fast food restaurant dating to 1961, and located right here on US-23. The building is new, but the location and the chain fit our date. And if you just have to make one more sightseeing cruise before you stay put for the night, I suggest a drive past the grand Neo-Gothic St. Stanislaus Kostka Roman Catholic Church. It's on Bay City's east side, at the corner of Kosciuszko Av. and Farragut St. Besides being a beautiful church, almost a cathedral in style, it serves as a monument to the large Polish population that settled here in the period 1874 through 1892. Dobranoc! (That's Polish for good night.) See you tomorrow on Roadtrip-'62 ™ !